Last week, The Root published an article criticizing a meme that made fun of black women who wear weaves. 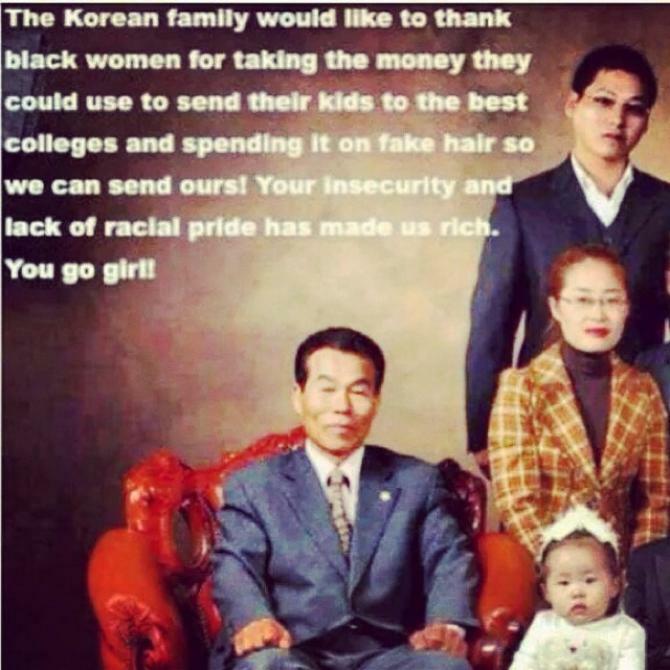 Writer Jenée Desmond-Harris pointed out that this meme makes various assumptions about black women and their hair. Contrary to what I expected, when I scrolled through the comments, tons of people agreed with the meme. Many of them argued that all black women who do not wear their hair in a natural style are struggling with low self-esteem, internalized racism, and self-hate. In order to pull some folks out of this shallow, misguided thinking, I immediately felt the need to write this post. Let a buzzed-cut girl (who’s been natural her whole life) break it down. It’s passed time to end this hair feud. Now I won’t sit here and act like internalized racism isn’t an issue in our community. Some people have been taught (at very young ages) that nappy hair is ugly and unkempt. Sometimes weaves, relaxers and other hair trends are an expression of the internalized black hate that has been in our world for centuries. However, not every girl with a weave has internalized racist views about her hair. Wearing a weave doesn’t automatically mean you have low self-esteem or self-hate just like wearing natural hair doesn’t automatically mean you’re confident. Michelle Obama wears a weave. So does Janet Mock, Oprah, Shonda Rhimes, Kerry Washington, Beverly Bond (Creator of Black Girls Rock), and many other powerful women. These women have to have a certain level of confidence in order to make it as far as they have. Oftentimes women wear weaves for protective styling and convenience. Sometimes it’s easier to throw on a cute wig or wear a weave rather than raking through your hair and styling it all the time. Natural styles, including locs, can take quite a bit of time and effort to maintain. Being natural isn’t always easy. It takes a lot of courage to be natural in a society that has an all-around hate for natural hair. 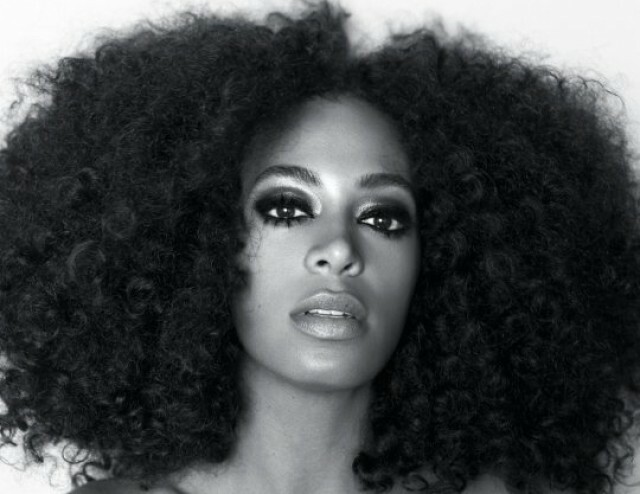 Natural girls get very little love in the mainstream, as very few of our major pop stars wear their hair natural when they’re in the spotlight. You hardly find natural hair in Hollywood, fashion, or even the White House (Wouldn’t it be cool to see FLOTUS rockin some double-strand twists). Natural hair is still pretty revolutionary, because unfortunately, our world still has an obsession with European standards of beauty Unfortunately, our naturalistas are penalized and attacked for wearing their natural hair in various situations. Locs and afros are often viewed as unprofessional in a work environment, several private schools have banned little black girls from wearing afro puffs, and black women in the military have recently faced stricter regulations on certain natural styles. Yet, natural hair has become on-trend lately. Tons of women are having the Big Chop, and there are beauty bloggers, tons of Pintrest, Tumblr, and Instagram accounts dedicated to natural hair. Yes, we do need to teach that black hair is beautiful in its natural state, but we don’t need to shame others for straighter styles. There are benefits and drawbacks to both natural hair, weaves, and relaxed hair. People do what works best for them. Mind ya business, that’s all. Just mind ya business. If it ain’t growing out of your scalp then you have no need to comment or feel any type of way about it. Love what you read? Share it with your friends on Facebook! Allow me to say I love the natural and the weaved. I just love it. I also love to share this new fake ultrasound design from fakeababy. It is very funny and amazing. Check this out. Natural hair is never a bad choice. Hey Thanks. If you’d like to get auto-updates when I post (about 3 times a month), hit the subscribe button at the top. I hate that there is ONE more subject to divide us now. It does not bother me that women wear weaves but the meme has a lot of truth to it. One of the hardest thing about being natural, as you pointed out, is the amount of courage it takes. I agree, like you, that not everyone who wears a weave suffers from identity issues. Matter of fact I think MOST African American women are secure in their blackness and despite all the isht we deal with would not readily change to another ethnic group. I do think that there is a level of pain with those who choose to stay in weaves 90% of the time. I mean, when you take down that hair and if your hair is not being taken care of underneath, how must a woman feel about herself. Have you seen the campaign BLEND IN FOR WHAT? it is a lovely reminder that we are unique…our hair is unique…our features…our bodies etc and all of it makes us beautiful. In some cases Black women in the world that are wearing weaves are not just a mental issue of hair. It’s an acceptance issue amongst white society that date back years. For years black’s have always wanted to be accepted in society in every aspect imaginable. Acceptance in intregration, work force, school education, housing, and yes acceptance in image. Let us break this down, lets consider the source. We have been ridiculed for so long, we refused to look horrible in public. If there is a low self esteem problem, could you blame black women or black people in general for doing what they can to be accepted image wise? You need to also understand most black’s decades ago were not loving acceptance of their own look because of the fact that all we saw was white. Back in the days long before Black Power Image of Good Times, The Jeffersons, Richard Pryor, Eddie Murphy, Bill Cosby Show, Ophra Winfrey, etc. we saw white. All the successfull black’s we now look up to more than ever including the movie and music entertainer’s today that made us proud was not always like that. White discrimination,Advertisement and Imagery played a big part in the black Psyche. The little black girl’s & boy’s saw white Barbie Ken’s and wanted long natural slick hair. Black people had Jerry Curl’s in the 80’s becouse more or less they wanted that so called “good curly hair”. Most of curl advertisements came from Soul Train sponsors in this time. Everything comes down to advertisemnet, the easiest thing to tap in America. Most women do not have the gene’s to grow their hair quicker than a man’s hair. They rather take the easy route and put a weave to cover the true problem. Rather than go natural and deal with the constant combing, why not get a weave. No diffrent than a man white or black hate of going bald, they rather get a transplant. Unfortunately, you do have women who want that long weave down to their ankel’s. That shows the questionable characteristic’s of possible wanting to be white or mixed in some form or fashion. My point, everyone has their reason’s. F.y.I. Michelle Obama and some black women do not need a weave. They put a weave on to not have the constant dealing with the hair. I’m a man and I know that…..